If you follow my social media channels you will probably know that me and Aaron recently bought a house which is extremely exciting! We moved in at the beginning of the month and our new furniture has slowly been arriving. As it’s a new build all our walls are plain white so I’ve been trying to add a little colour to the rooms, at the moment we’re concentrating on the ground floor of the house and then make our way upstairs, decorating a room at a time. Before we even moved in we had ordered furniture to go with the theme decided for our living room which includes greys, blues and gold details. 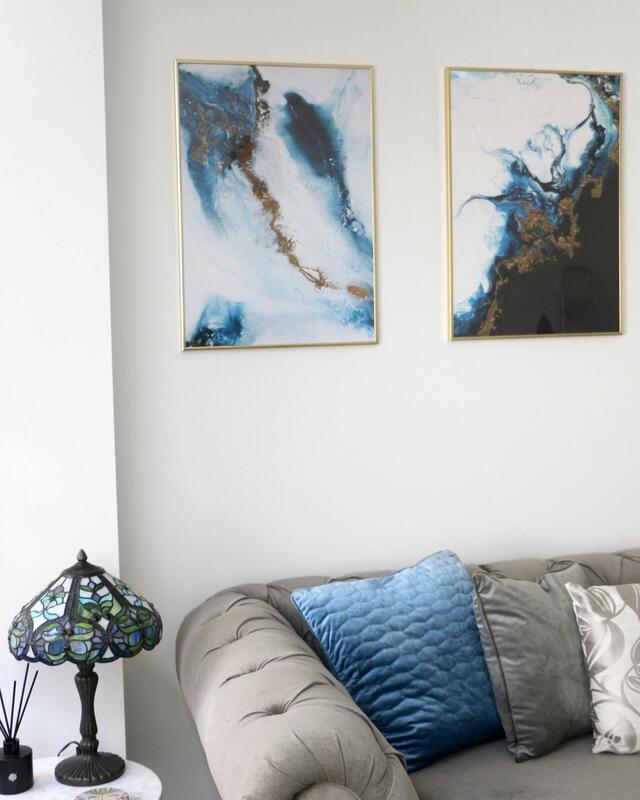 As soon as I spotted these beautiful blue abstract prints on Desenio I knew instantly that they were perfect and exactly what I was looking for. I chose these three which go really well together with the first two called ‘Into the Blue’ and ‘Blue Tide’. The texture of the canvas can be seen on these prints as the design was originally an acrylic painting on canvas. 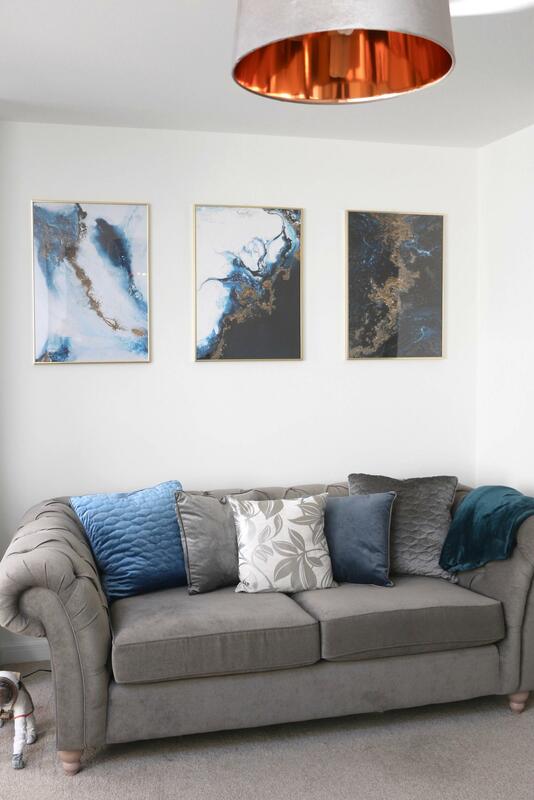 I was going to choose three different prints that complimented each other but weren’t as similar, however after noticing the last print ‘Blue Tide’ and putting them together on the Desenio gallery wall feature to see what they looked like I knew I had to have the set. 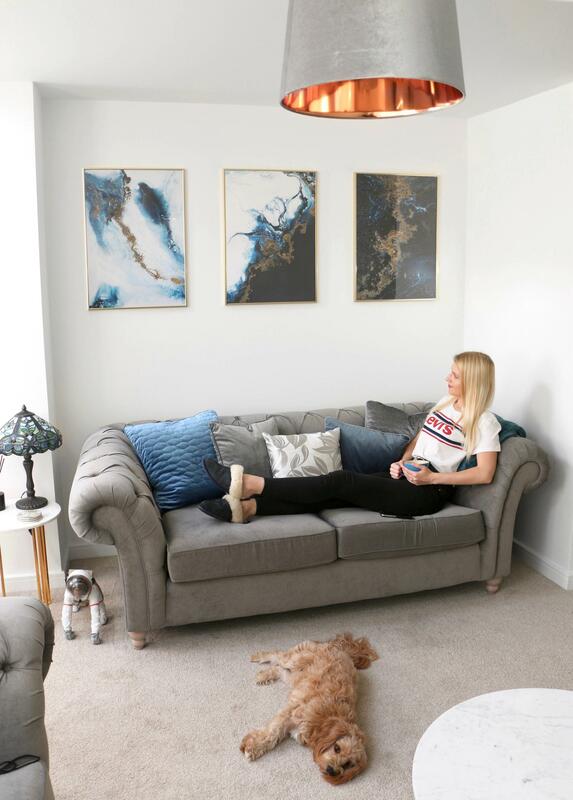 As we’ve been going mainly for gold features within the living room, the gold frames were an easy decision but what I didn’t realise was how much they made the prints stand out which I love. Desenio has a huge range of different posters for all styles including photographs, typography and art prints in a range of different sizes from as small as 13 x 18 to large 70 x 100 prints (these ones are 50 x 70). If you’re stuck on deciding what prints go well together, they have a ‘perfect pair’ page which will help with inspiration. 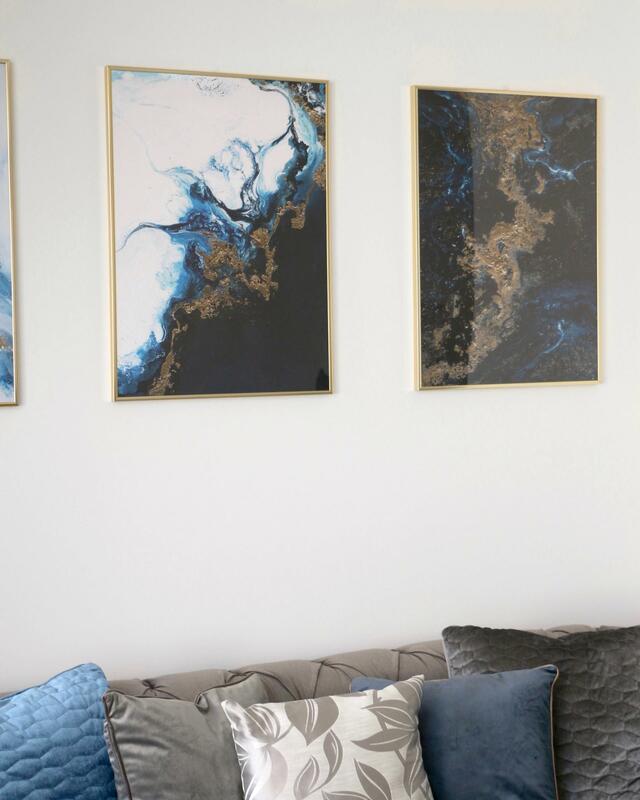 We’ve still got a lot of decorating to finish however these have added an instant pop of colour to the living room and I can’t wait to decorate the rest of my house with lovely prints. “The code “REBECCACOCO” gives 25% off posters* on all of our sites between November 27th and 29th. *Except for frames and handpicked-/collaboration posters”. 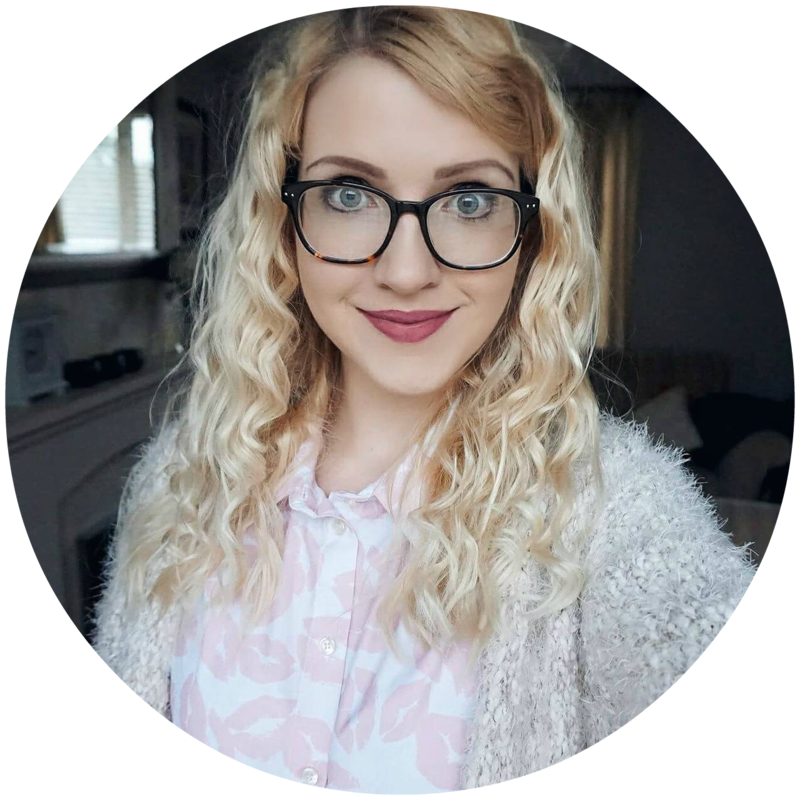 Blogosphere Magazine | The Subscription You NEED! Previous Post How Instagrammable Is Your Travel? Omg can I copy these exact prints?? Your post has made the decision to go for Desenio prints after seeing them on social, just wish your discount code was available until payday!! Will still be ordering thought! !